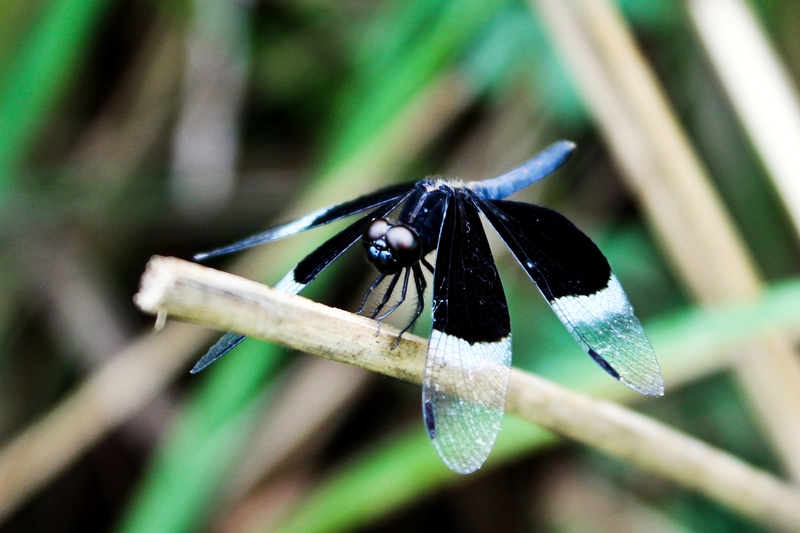 The Paddy Skimmer is one of the smaller species of dragonfly that can be seen in the Western Ghats. Measuring about an inch long, their flight range is very limited, although apparently their breeding capabilities are unhindered, as they are without a doubt one of the most numerous species to be seen in fields, both wild and cultivated. 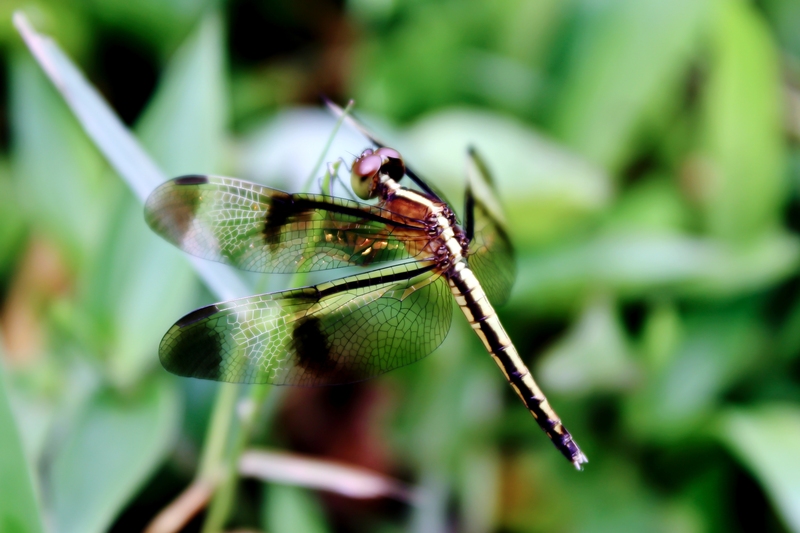 The teneral (young) male has a black and gold body, green and red eyes, and would be difficult to distinguish from the female if it weren’t for the differences in their wings – the male’s (both in youth and maturity) are about half black, with the other half equally divided between a white strip and a transparent tip. 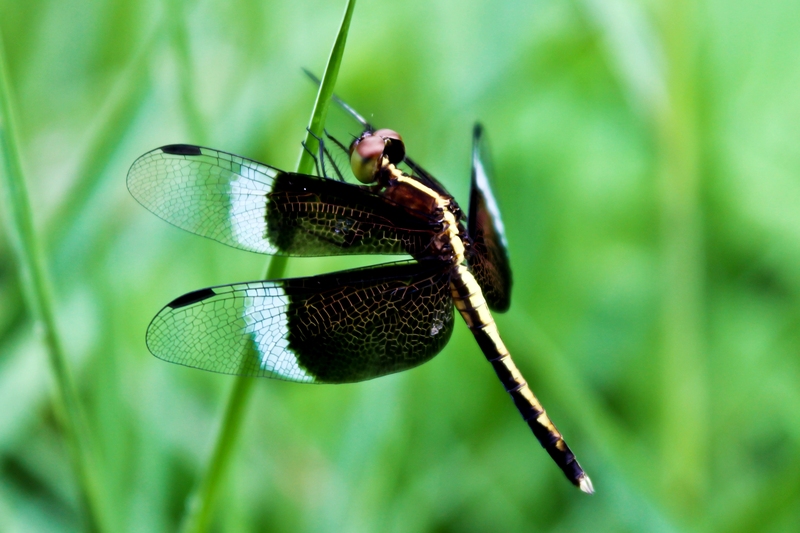 The female’s wings are more complicatedly patterned, although mainly transparent. As the male matures, his abdomen and thorax become bluer, losing all traces of gold and eventually black. Completing the transformation, his eyes will morph from green and red into a metallic maroon color. All photographs taken in the Periyar Tiger Reserve. Amazing. Beautiful creatures and beautiful photos. Thanks for sharing. I wish I had some pictures with an object to show the scale, they are much smaller than they look in the pictures.